A woman walking through poppy fields in the Alpes de Haute in Provence, France is surrounded by the beautiful red coloring spanning across the landscape. 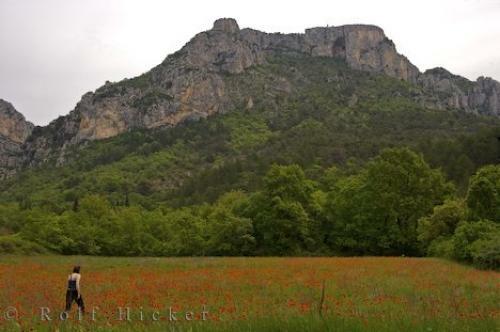 High rock cliffs tower above the poppy fields which are adorned in bright red hues as a woman is caught enjoying their beauty while walking through them. Nothing is prettier during the Spring in France than wide open fields filled with blossoming poppies.A woman walking in a field of Poppies near Moustiers Ste Marie, Alpes de Haute, Provence, France, Europe. Model Released. Photo of a woman walking across the open landscape through the poppy fields near Moustiers Ste Marie in Provence, France.